Rushmore of songs with a color in the title: Purple Rain, Blue Suede Shoes, Brown-eyed Girl and White Christmas. Please note we have choices we enjoy more than these, but it's hard to argue wth the universal fame and renown of these — and several others, too. (And yes, in Germany 99 Luft Balloons is far left, just like in Mexico, "Amarillo by Morning" is a no-doubter.) This one was way harder than we expected considering the ones left off in so many various colors and categories. Heck in black alone, we left off Back in Black, Black Magic Woman, Blackhearted Woman, Blackbird and Pearl Jam's Black. In the multiple color category we left off, "Rednecks, White Socks and Blue Ribbon Beer," which is one part poetry and one part life advice. And we had to leave some true country anthems — Blue Eyes Crying in the Rain, Red Solo Cup, Rose Colored Glasses, John Deere Green, Forever in Blue Jeans, Don't It Make my Brown Eyes Blue, Long Black Veil, Man in Black, so many others. This one is easily contested considering the number of greats we left off. We thought for sure Pink Houses, Purple Haze and so many others were so very close. My head hurts. Rushmore of best athlete quotes: Spy was right, this list starts with Ali, and he has too many to name. How good was Ali as a quote? His interviews and answers helped create the largest sports media person of all-time in Howard Cosell. We'll go with Ruth next if for nothing more than his "I had a better year" when asked why he was being paid more than the president. (Side note: Certainly athletes now make 10-to-100 times what POTUS makes — and that's a discussion of misguided standards and value-placement all to itself — but in today's overreactive, hyper-sensitive world, that famous Ruth line would get him a "Shut up and swing the bat" reaction, no?) Next we'll go Ric Flair. Yep, we went 'rastler. What of it? And of course, Yogi Berra. Rushmore of Eves: On the calendar it would be Christmas Eve, New Year's Eve, All Hallow's Eve, and an evening Co-Cola on the screened-in porch to end the day, especially on a Midsummer Night's Eve. Good times. In people form, we'll go Eve from Adam and Eve, Eve Plumb (aka Jan Brady), Eve (the wrestler) and Eve (the rapper). Apparently Eve is a fine one-name name. "Is Mark Richt about to get fired?" or "When did Mark Richt forget how to coach?" Yes we were on Wisconsin and thought the Badgers would win outright as a 3-point underdog. But sweet buckets of "Watt Was That Wisconsin" (wait for it) and where did that are kicking come from? Miami is broken and the ebbs and flows of Da U are legendary. When things are going right, the Green and Orange waves crash over foes like a real hurricane. When the breaks are going against the boys, well, the finger-pointing and lack of effort becomes embarrassingly obvious and obviously embarrassing. Miami's defense was top-shelf this year statistically. That said, you have to wonder how many ACC stat leaders are influenced by the lack of ACC stat-producers. Still Wisconsin ran the ball right down Miami's throat, especially in the second half. And part of that defensive fold job was because the offense was completely inept. Turnovers. Bad throws. Missed blocks. A playbook that apparently only features bubble screens and go routes. 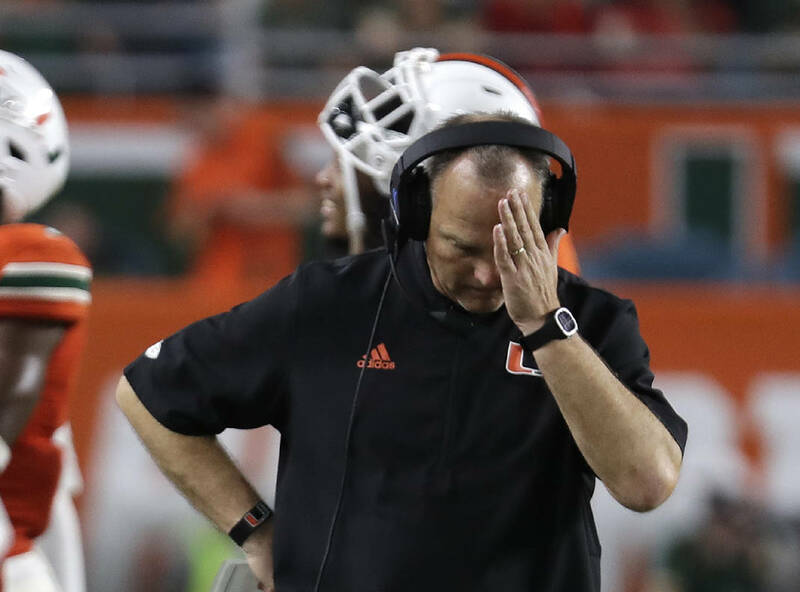 It's fair to wonder if Richt — an alum of the U — is on the hot seat next year. We do not think he cracks the top five, but let's remember that after a 10-0 start to 2017, the Canes and Richt are a less-than-impressive 7-9. Side note: The coaching seat carousel next year will be a spinning' for sure. Think of the potential destination gigs that could be open. Clay Helton's seat is the hottest in America and USC is a legit top 5 or top 7 gig. Malzahn's seat is smoldering and Auburn is a big-boy job. Even in year two Willie Taggart's tenure in Tallahassee is tenuous. If Ryan Day falls completely flat next year at THE Ohio State, well, who knows what that could mean. So it's clear that Urban Liar will have several landing spots when he wakes up next November and realizes that he needs to be back working and molding the minds of young people. The Titans have never beaten the Colts with Luck under center, but these Titans have defied the odds at times this season. Still, i agree that Mariota will not play, but i think its the absence of Jurell Casey that will hurt the most. I felt like the Titans had a much better chance if they could keep pressure on Luck. Either way, Mariota or no Mariota, i don't think the Titans win, and as we look at the close of another season of football in Nashville, again the question is "Is Mariota the guy?" He has had flashes, but the questions about his durability make me less confident. Theres also the question of what to do with Derek Henry? So is being 9-7, 2 games above .500, but not making the playoffs, and being just good enough to not be able to get a Top 15 draft pick , and questions about the QB that you built around and expected to be a Top 10 NFL QB about the worst spot to be in as an NFL team? First, completely agree on Casey. Dude is a menace, and we are in a place that interior pass-rushers who also play the draws and middle screens well are worth their weight in Co-Colas. Especially against someone like Andrew Luck, because if the Titans have to bring a variety of blitz looks to get pressure, well, here's betting Luck hits them for a slew of chunk plays. Man, the spin cycle of mediocrity the Titans are currently churning has to be frustrating for their fans. Even if they get into the playoffs, does anyone truly think this team has what it takes to win three games and get to a Super Bowl? No, neither do I. So where does that leave you? Well, that question, while vague and certainly offers nobility in pursuing an answer. But the edges of that question all point to Marcus Mariota and the conversation of whether he's a franchise quarterback. Yes, he's completing better than 68 percent of his throws, but those throws are more check downs and screens than anything. Yes, he has helped the team to a win-and-your-in spot without Delanie Walker, his most trusted receiving option, and the stunted growth of Corey Davis, who looks like Jerry Rice one week and Jerry Lewis the next. (Hey LAY-DIEEEEES!!!) But he also seemingly always has one foot in the trainer's room and one item on the injury report. OK, maybe it's not fair to measure Mariota to Rodgers, who is the best I've ever seen play the position. But where do you start that baseline when you are trying to determine whether Mariota deserves franchise starting money? If we start clicking down the top five or 10 Brees, Brady, Rivers, Big Ben, Rodgers to start a quick top five. Yes Mariota's younger, but would any of those teams trade any of those dudes for Mariota? Of course not. What about the next tier? Andrew Luck, Kirk Cousins, Cam Newton, Derek Carr, Matt Stafford, Russell Wilson and Matt Ryan. Those dudes have signed the next-level deals and we're pretty sure none of those teams would trade their guy for Mariota either. Wipe the next-gen guys from the discussion because the skills and promise of Deshaun Watson and Patrick Mahomes and Jared Goff and Carson Wentz combined with their current affordability is the reason that three of those dudes are likely going to have a playoff bye next week and the other was part of last year's Super Bowl champ. And we're pretty sure the Browns and the Jets and the Ravens are completely happy with their rookie starters too. So where does that leave the Titans and Mariota? That is 19 quarterback situations off the cuff that certainly appear better than what the Titans have currently. And if you are going to extend the QB because it is the safer play and it avoids the unknown of finding the next QB, well, which two or three starters are going to be a casualty of those checks, because it almost assuredly will be Derrick Henry, who has been the beast the last month a lot of us expected from Day 1. Personally, I'd send Mariota packing after next season — the Titans have the option — and next spring with the draft in Nashville, we look to trade up in front of Jacksonville and take whichever quarterback you perceive to be the best from this draft class. On Monday, I suggested that the wrestling ref who made the high school wrestler cut his dreads was a loser. Unless I missed it, neither Jay nor the 5@10 peanut gallery, outside of my post, has mentioned the incident. When you add in that the ref had earlier been suspended for directing a racial epithet at another ref, this is a blot on the sports world at a time when most of America is talking about such things. So my question for Friday's bag is this: Is this one too hot to handle, or can you share some words of wisdom? Fair question, and in truth, not really. It also made me think of the LeBron issues Stewwie raised earlier this week with this post: "A belated weekend loser to LeBron for his terrible comments about NFL owners. It's become clear that he's a racist and no one in the mainstream media seems to care. Leave it to Clay Travis to be the only one out there who is willing to be critical of the comments, not just for the racial tone, but for how uneducated and hypocritical they were. Very good write-up from the gay Muslim libertarian Senate-hopeful king of the internet." For those unaware about the wrestling official that made the wrestler cut his dreads, here is the story. As for the topic being too hot, I do not think so. Sadly, I think it is becoming too tired. Everywhere we look these days there are knuckleheads doing knuckle-headed things. This ref likely will be exiled before the season is out and to that we say good-riddance, especially if the stories are true about him having a history of using racial slurs in competitive arenas. And in truth, that is one of the reasons we point a mocking finger at the faux-outrage of so many around us who are super quick to be outraged by the tiniest of controversies and the latest Twitter cause of the social justice warriors. All that angst makes us more and more deaf and obtuse to the real scenarios that deserve scrutiny and scorn. And in truth the LeBron stuff is more interesting, and if it had not happened at this intersection of holidays and football and everything else, maybe that would have been a bigger story. Such an amazing question. And one we want group input from. So, what say you big-brained readers, the first annual 5-at-10 Jackwagon of the Year award. We know who some of these folks may nominate for the local version of the Jackwagon of the Year Award. "This Christmas has been great without your tripe on A2. A happy new year would be you finding a new job." "You are what's wrong with this country!!! Have you ever been a part of a team or even played a sport or have you always been a pencil-pushing geek sitting on the sideline. If you knew what it meant to be on a team you would know why real fans are (ticked) off at these ungrateful college players thinking only of themselves and sitting out the bowl games that fans pay good money to go see. Where's the commitment? You think Knute Rockne or Lombardi or Woody Hayes would have put uno with this (poop)? Of course not, and you are praising them for it. You make me sick."